After enduring decades of conflict, women in Afghanistan are developing networks between cities and rural communities to unite women across the country in protest. Can they defy cultural traditions and taboos to lead a protest movement for peace? “Helmand has turned into a graveyard,” says 19-year-old Amina Masoom, one of the organisers of the Helmand women’s sit-in. Masoom was just nine when she was orphaned. At the age of 18 she became a widow. Mostly young people are buried in the new cemeteries, made after Helmand became the centre of conflict between the Afghan army and the Taliban in 2014. Every grave has a different, painful story. Mothers, sisters and widows stand with children by the graves praying, crying and talking with the dead, believing that those in the graves can still listen but can no longer respond. “Every day there is a new tragedy. We have been facing these tragedies for 40 years. It’s the longest war in our history,” Masoom says. Though everyone is suffering in the conflict, for women there are extra challenges in the absence of fathers, brothers, sons and husbands, who are fighting, missing or dead. Since the conflict started, 2.5 million women in Afghanistan have become widows. Besides losing fathers, brothers and husbands, they also become the carers for the injured, disabled and those living with mental health difficulties. Traditionally women do not have the right to become the breadwinners and raise their voices for peace. There are people living with disabilities and war-related conditions in every home. 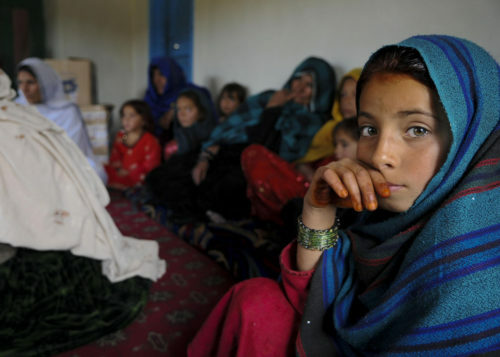 Read more: Why are we giving up on girls’ education in Afghanistan? Last March, a bomb struck in Helmand, killing 16 people and injuring 40. In response, a group of young men, whose families had been affected by the blast, staged a sit-in in the province. Later, women and girls – including Masoom – joined them. Wearing blue sashes and calling themselves the “Helmand Peace Convoy”, the men at the sit-in then marched over 700km on foot for 38 days to reach Kabul to demand an end to four decades of war. 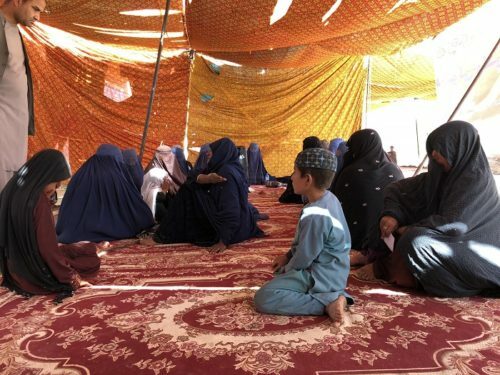 Though the sit-in and long march did not end the conflict, they compelled the government and the Taliban to enter a three-day ceasefire over the holy festival of Eid Al-Fitr – the first time this has happened since 2001. The sit-in and march have captured the imagination of many Afghan women and are now energising the women’s peace movement across the country. For the first time in the history of Afghanistan, women in a deeply conservative society have started a campaign in various provinces asking the Taliban to end the insurgency and to stop making them widows and their children orphans. Most of these women have lost their fathers, brothers, and husbands and are now calling for an end to the killing. 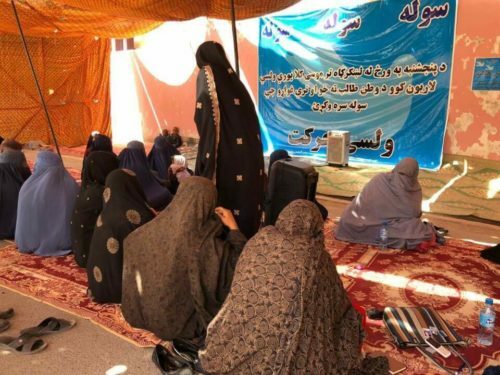 They have protested in various provinces across the country including Nangarhar, Kabul, Bamyan and held the week-long sit-in in Helmand bringing together women of various tribes, without the organisation of a political party. They believe that this war can only be ended by the combined struggle of women and they are developing networks, going village-to-village and door-to-door, with women across other provinces to motivate and support one another and begin a country-wide movement for peace. I am contacting women across various provinces to organise a women’s peace march in order to make Afghanistan the land of peace. “Until now, around 300 women have pledged they will join the campaign,” says Danish, a peace activist who brought women for the first time to the sit-in in Kabul last year. The peaceful protest sparked follow-up sit-ins in Helmand and Jalalabad. This campaign is very different from the men’s march as women in the cities are working in union with their counterparts in rural Afghanistan. Next, they plan to visit the homes of Taliban members. They believing that if they can succeed in convincing the Taliban mothers and wives of the importance of peace they could, in turn, influence the men. “We have seen only carnage, blood, and injuries in our lives,” says Danish. “We cannot remain silent. 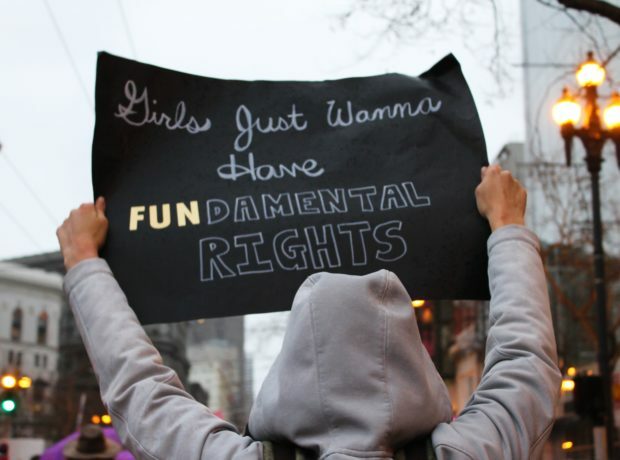 Women must now turn their energies to ending a conflict that is brutally destructive for us. Afghan women want peace and cannot bear war anymore. In November, Russia hosted an international conference on Afghanistan in Moscow which aimed to open up the possibility of peace talks. It was the first time that members of Afghanistan’s High Peace Council and the Taliban had participated in such an event after decades of war. 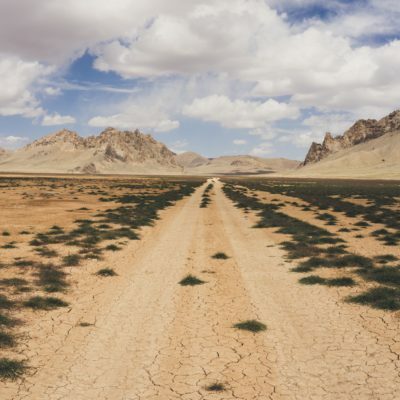 In Afghan culture, it is considered wrong when women protest alongside men in the cities, but women do have a special role in resolving conflict. Historically, whenever men fail to resolve conflict between two groups it falls to the women to form a committee of mediators to deal with the issue. No group can ignore or discount the women’s demands during the conflict as this is widely understood to be wrong and a violation of the Pashtunwali (the unwritten code of conduct of Pashtun, the largest ethnic group of Afghanistan). Afghanistan’s modern women activists intend to play both these roles. In the cities, they plan to protest to draw public attention and media coverage, and in their villages they will play the traditional role of mediators. For women activists, it’s often hard to take part in peace activities outside Kabul. The rest of Afghanistan remains extremely conservative, and leaving home without a male guardian is deemed morally wrong. Aside from tradition, the Taliban dramatically diminished the social role of women, demanding they cover every inch of skin in loose-fitting burqa when leaving home. Although women peace activists in Helmand, Kabul and Jalalabad have been bolstered by progressive and secular groups, the movement still faces major challenges due to cultural taboos. They are not only campaigning for peace but also challenging gender stereotypes to create space in their society for peace activism. They have faced harsh criticism from religious people who say women protesting in public with men goes against the values of Islam. 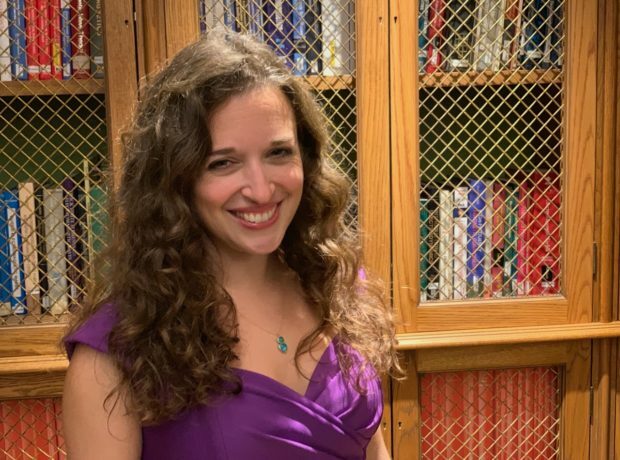 “Culture is one of the hardest challenges for female peace activists; they cannot run a successful movement without grappling with custom,” says Rafi Jalal, an anthropologist based in Kabul. “Women must consult with tribal elders, legislators and members of the jirga [a tribal court in Afghanistan] in order to get the support from these influential people,” says Jalal. On November 28, Afghan President Ashraf Ghani announced a team to hold peace talks with the Taliban, while addressing the world representatives at the Geneva Conference on Afghanistan in Switzerland. But Ghani’s announcement disappointed women across the country as they are under-represented in the committee, with only three women in the 12-member negotiation team. 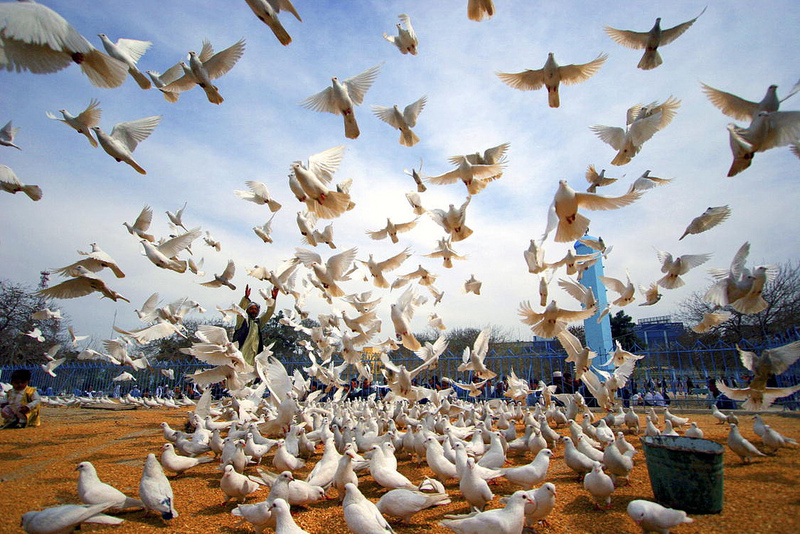 Main image by UN shows doves flying at the Hazrat-i-Ali mosque, in Mazar-i-Sharif, Afghanistan, on the International Day of Peace.